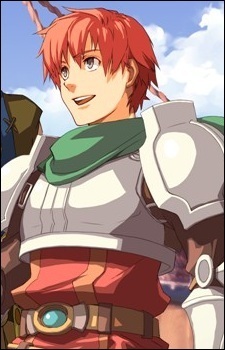 Adol Christin is the primary protagonist. He has an uncanny knack for being at or arriving to the right place at the right time. He also has the curious habit of falling into the sea, and washing up on beaches, being rescued and nursed back to health by each game's female lead. Not much is known about Adol's past, except that he was born in a small nameless mountain village. Adol came from a peasant family, but still manage to live a normal daily life, it's shown in the intro of Ys I that he was taught by his father, and sometimes later, a traveler came to his village, this event made Adol to aspire to become an adventurer. He started his adventure when he was 16.